The papers yesterday were full of news about bananas. The Wall Street Journal reported that Chiquita Brands International, “the Cincinnati-based banana distributor” (I love that phrase; it evokes Lardner, or at least Runyon), was expected to report a third-quarter loss due to higher fuel costs and bad weather in banana-growing countries. Chiquita stock fell sharply on the news. The second article was far more interesting, and answered a question I’ve long wondered about: why are bananas so cheap relative to other fruit, especially since a lot of the fruit we consume in the U.S. is grown here while bananas are not? That bananas have long been the cheapest fruit at the grocery store is astonishing. They’re grown thousands of miles away, they must be transported in cooled containers, and even then they survive no more than two weeks after they’re cut off the tree. Apples, in contrast, are typically grown within a few hundred miles of the store and keep for months in a basket out in the garage. Yet apples traditionally have cost at least twice as much per pound as bananas. Once bananas had become widely popular, the companies kept costs low by exercising iron-fisted control over the Latin American countries where the fruit was grown. Workers could not be allowed such basic rights as health care, decent wages, or the right to congregate. … Over and over, banana companies, aided by the American military, intervened whenever there was a chance that any “banana republic” might end its cooperation. … Labor is still cheap in these countries, and growers still resort to heavy-handed tactics. The final piece of the banana pricing equation is genetics. Unlike apple and orange growers, banana importers sell only a single variety of their fruit, the Cavendish. There are more than 1,000 varieties of bananas — most of them in Africa and Asia — but except for an occasional exotic, the Cavendish is the only banana we see in our markets. … By sticking to this single variety, the banana industry ensures that all the bananas in a shipment ripen at the same rate, creating huge economies of scale. The Cavendish is the fruit equivalent of a fast-food hamburger: efficient to produce, uniform in quality, and universally affordable. Some readers may recoil at this description and vow to never eat another banana. Others may thank their lucky stars that free markets are able to deliver a tasty, healthy, peel-intact fruit to their corner stores at very affordable prices. In recent years, American consumers have begun seeing the benefits — to health, to the economy, and to the environment — of buying foods that are grown close to our homes. … [B]ananas have always been an emblem of a long-distance food chain. Perhaps it’s time we recognize bananas for what they are: an exotic fruit that, some day soon, may slip beyond our reach. I am guessing this prognosis is alarmist but I have no way of knowing. Can anyone out there add some insight? where are these banana lines coming from that you guys are quoting at each other? i want in! I never liked bananas until I went to a region of Tanzania where the agriculture was Banana/Maize based. They had about 6 different varieties of bananas for different purposes, all seedless and most tasted much better than anything here. The thing that surprises me is that fruit companies don't explore other varieties that they could sell at different premiums. Look at the varieties of almost all other commonly consumed fruit, why not bananas? This story is somehow told in the book "One hundred years of solitude". Also I hope you find out how Chiquita payed for paramilitary here in Colombia. Sweet, bloody bananas. One of the reasons that bananas may be cheaper in America despite being grown out of the country could be that they are grown out of the country. With a strong protectionist system in place for all those farm products grown in America, this would keep the price of other fruits up. I'm currently living in northeast China, and bananas are available in supermarkets and every fruit stand on the streets. A bunch from the local Walmart cost around 11-13 RMB ($1.59-$1.88) but tend to be fairly poor quality. However, bananas sold on the streets rival some of the largest ones I've seen in the US, are much better quality than those in Walmart, and cost 5-7 RMB ($0.72-$1.01) a bunch. Can't beat that. I see little Chinese kids eating bananas more often than other fruits, much like back in the states. I gather that it's a universally-liked fruit. I wish we had a more variety of bananas. It's not fair!!!! Here in Hawaii we get Mangoes from Peru, Papayas from Costa Rica, Bananas from Colombia, and our orchids from Thailand and SE Asia. However, I can find all of these things growing wild about the island. Wild Local Hawaii Bananas are far better than the imports. i am from philippines, and i can say, don't worry, banana will not be extinct soon. lots of third world natives are lazy, i mean lazy in not thinking about the future, but only of the present. they would gladly lease their property to your for immediate gratification. its no wonder you can see lots of natives with lots of uneducated children. you don't really need seeds to plant banana. you just cut off the old one and new ones will sprout from the side. yes, we do eat bananas but its not our staple diet. our staple diet is still rice. but bananas are easier to maintain than rice. rotten bananas can also be fed to backyard pigs. which wallows in the mud, which causes dengue, which is good because it helps control our exploding population. i know i am sarcastic, if you live in my country you would be. have you seen the track record of some of our senators? a joker, a few action stars, and a female clown. Are you serious? they were sending bananas on their branches? Anyway, as far as I know/estimate; half of the cost/box of banana are mainly on Shipping. And the other half are the sum of other activities from planting to transportaion w/ cold chain. You've never actually set foot in a supermarket, have you? I'm from the Philippines and we do grow a lot of bananas. Most of the banana plantations are in Mindanao because of the stable climate conditions and fertile soil. The crops from from these plantations are only for export, and they only grow Cavendish there. The bananas they pick are still unripe when harvested to keep them firm durig transportation. About the condition of the employees. Right now, employees of large companies like Dole and Del Monte experience fair labor practices. Most of the land of the plantations were under Agrarian reform, so the farmers own the land, which they rent to the companies to plant. The farmers are hired as employees, so aside from rent from land, they also get wages, and they have a stable job. These gives them incentives to be more productive, and hence higher manufacturing efficiency. But this was not the case 30 years ago, before land reform. Farmers were tenants, and they were planting the land which were owned by really rich families. They had no security of tenure. They were overworked and underpaid, and yes, there were no healthcare benefits. there was also child labor: children of farmers would rather skip school and help in planting to increase family income. Also sometimes, there were unjust land owners. They have control over the farmers and their families because they feared being thrown away from from the farms, their only livelihood and their homes. And in the Philippines, bananas are staple foods, specially in the really poor provinces where rice and corn are very expensive. As for how I enjoy my bananas, I create a dessert by adding crushed peanuts and chocolate powder over thin banana slices. Yummy! And yes, peanut-butter-banana-sandwhich is the best! To make it extra special, I add some chocolate powder or chocolate syrup over it. Of all banana varieties I've tried, the native variety tastes the best. It grows wild, it's ripe when it has deep green color. It has plenty of seeds that look like peppercorns. They are very firm from the outside, but very sweet and soft inside. I'm not sure how an economist can consider the banana industry to even remotely resemble a free market, especially right after he inserts a quote detailing how entire governments were overthrown and armed force has been used for over a century to make the industry profitable. That's about as far from a free market as I can imagine a product being -- hold your workers at gunpoint, prevent outsiders from interfering, and pass the costs of such measures onto the taxpayers of the United States! "A previous comment mentioned Wikipedia, but for this kind of thing I think Snopes is far better"
The article says the exact same thing that I did, namely that the Cavendish is threatened. It also mentions that there hundreds of other varieties of bananas; which is true, but irrelevant. There's a good reason the cavendish is the only one sold in Europe/US: it's sweet, seedless, and easily transported. Those other varieties do not look or taste anything like it. Those other, tasty bananas you find in tropical countries? They don't survive shipping. Comment #1 (jz): Bananas are refrigerated during transport. If they are not refrigerated, they ripen too quickly on the somewhat slow journey on cargo ships. Also there is special handling and technology See refrigeration -- if I recall correctly, the banana industry invented refrigerated ship-holds and shipping containers. Handling is also important. Cavendish do not have the thickest skins among bananas. A small dent or mar in the fresh-picked pre-transport stage shows up as those nasty looking and super-sweet brown spots on the fruit when you eat it. And as for massive geography to grow them; yes and no. True, bananas can be grown across the equatorial and tropical regions and are relatively hardy fruit. 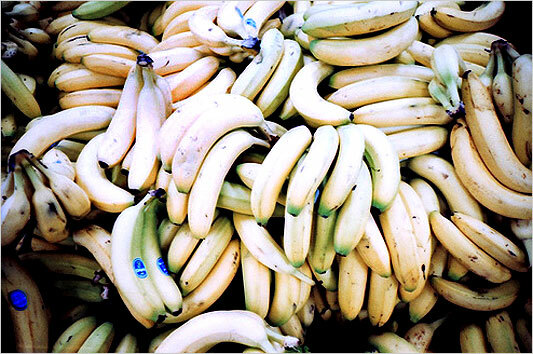 But bananas, including the Cavendish, are susceptible to ineradicable soil fungi and other diseases. Comment #3 (jefferytg): Banana workers were denied healthcare in so-called "banana republics." Banana workers in many countries, for many years, were essentially slaves. In Australia, bananas mostly come from one of our northern states (close to the equator). I very much doubt that ANY are imported. Last year a cyclone ripped through area which holds the major banana plantations. Prices went from $2-3/kg to almost $20/kg for several months. There was at least on incident of a banana transport being hijacked due to the value of the contents. Within six months the prices came down again as the next crop became available. A major problem with consumer banana is that they are seedless. While this is one reason that makes banana so uniformly tasty and easy to eat, it is a problem for the plants. They can only be grown by cloning. The Chiquita you eat today is genetically identical to the Chiquita you ate couple of years ago. Cloned plants are more prone to diseases. It is therefore when a banana plant has come to fruition, the "baby" clone is planted elsewhere and the "mother" is immediately destroyed. At the first sign of fungal infection, the entire area of banana plants must be burnt down completely to prevent spreading the diseases. Hence banana cultivation require a lot of land space and labor. Even if the plant can be grown in the US, the cost would not be affordable enough to be on the market. What I want to know is how Bananas in Asia compare. When I grow up in Hong Kong, bananas are mostly imported from the Philippines. They are not "exotic" but usually much more expensive than apples. (1 banana was about 80 cents USD) Oranges are cheapest because they are grown all across the south of China. Do they also face "Banana Republic" threat? Bananas are ridiculously expensive in Japan. They are wrapped in pretty packaging, 2 bananas cost about the same as a happy meal.